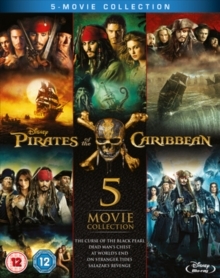 'Curse of the Black Pearl': English, German, Italian. 'Dead Man's Chest': English, German, Italian. 'At World's End': Danish, Dutch, English, Finnish, French, Icelandic, Norwegian, Spanish, Swedish. 'On Stranger Tides': Danish, Dutch, English, French, Finnish, Icelandic, Italian, Norwegian, Spanish, Swedish. 'Salazar's Revenge': Danish, Dutch, English, French, Finnish, Norwegian, Portuguese, Castillan Spanish, Swedish.